I am a big fan of this poem and I was so happy it was in a BabyLit version. The illustrations are so bright and creative. Of course, the absurd made up words may be a turn off but the original poem is an acquired taste to begin with. 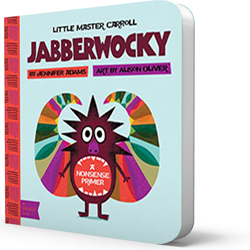 Please note that the book leaves out the part where the boy cuts off the jabberwocky's head. Always a good thing for little ones! My favorite thing about these books is the special coating to protect the pages from drool damage.